New business owners often come to me for a new website. Now, don’t get me wrong, of course I’m happy to oblige, but I also want them to know that having a great website by itself is not enough. With over a billion websites in existence*, a business owner cannot just sit back and hope someone finds them. The good news: there are both offline and online tools you can use to increase your company’s visibility. There are several “eTools”, i.e., online, I recommend. We recommend using these six tools together to get the most of the Internet’s reach. Each serve a particular purpose, so its not a matter of which one, but how to use them together effectively. To do that, the first thing is you need to be sure understand who you are targeting and what your messages are. #1. Have a Great Website – Your website serves as your “home base” where you can let your prospective clients know you can help them solve their problems, and call them to take the next step in engaging with your company. It needs to reflect who you are and represent your business well. Drive more traffic to your website with organic SEO, i.e., optimize your web pages with keywords that people would search for to find companies like yours, in your geography if you deal with local business. Links from other quality websites to yours are also important in search engine algorithms. Blogging is a great way to keep your SEO juice flowing with keyword reach, unique, useful and engaging posts on a regular basis. #3 Paid Advertising – Kick it up a notch with online paid advertisements such as Google AdWords and Facebook Ads. Drive more traffic directly to your website. This will enable prospects to self-select themselves. You can determine the demographics and geo targeting of who you want your ad to be seen by. #4 Strong Landing Pages are important follow-through for your Paid Ads. Be sure the web page your ad is linked to provides the information visitors are expecting after clicking on your ad – do not direct them to a generic page or home page where they don’t find the specific information you highlighted in the ad. There should also be a CTA (call-to-action) on the landing page, inviting the visitor to take the next step to solve their problem. #5. Email Marketing is a great way to stay connected and drive visitors back to your website. Include an opt-in form on your website and invite visitors to add themselves to your email list. Be sure to provide a way for the user to unsubscribe whenever they wish, and let them know they can do that upfront so they won’t fear being locked in. Sent out information related to the content on the web pages and blog posts they visited. #6. Social Media – Let’s “face” it… most of the world’s population is using at least one social media platform. Know which one your prospects live in so know which you should spend energy and resources are. But a Facebook page does not replace a website. The timeline content is transitory. Can you imagine posting information on your services to only have it disappear in a week? 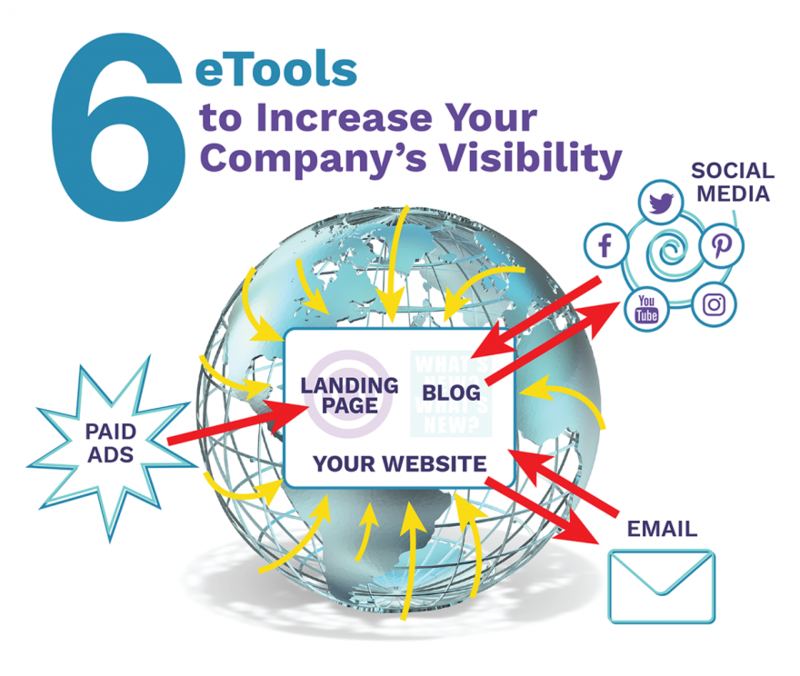 Use these etools together to get your message out about your business and reap the benefits. Best wishes! Want help implementing? Contact UmeWorks at 323 638-9328. “How do I SEO my website?” is a question I hear a lot. While Google Search Engine does not share its algorithm, but there are many things you or your webmaster can do to help your website’s Search Engine Ranking Position (SERP). Google is basically try to serve up websites that are relevant and useful in response to the user’s search query. So the methods we recommend you do are in response to Google’s objective so you can swoop in and save the day for your website’s SERP. Do you wonder what you can do to help your website get found on the Internet without paying thousands of dollars for paid ad campaigns? Super Hero Organic SEO is here to save the day. She has magic powers to share to help your website achieve higher rankings. For example, if you have two websites that are identical or similar, continually add some more content on their site on a consistent regular basis that is custom, unique content, not copied from someone else. Don’t leave it the way it was published from day one; the updated site will continue to rise in at search engine ranking, while the stagnant site’s SERP will decrease. This is why many website include blogs which makes it easy to continually add new content that is keyword rich. You may consider enhancing your blogs with images videos or audios. This increases the likelihood that humans will read it too. » Learn more about using your website content for Inbound Marketing to attract new clients. Heading tags – these are section titles and considered more important than paragraph text, so including keywords are helpful here. Meta title – which is 60 characters or less that describes what that page is about, again using keywords and Geo tags. Meta Description – according to Google’s blog, there is no limit to the number of characters allowed. However, if pulled into the snippet that appears below the page title in search results (which may be different on mobile vs. desktop), it may be truncated to 155-160 characters. It should be a short blurb containing keywords as possible, but be enticing so that a reader is encouraged to visit the web page. Meta title, title and description should be unique for each page. They should be specific to what the content is on that particular page. If you don’t update your own website, check with your webmaster to be sure this is being done. Optimize each web page for its specific, pertinent keyword phrases. Don’t try to optimize the entire website on each page. For example, you are selling marbles, it’s fine to have your home page optimized for keyword phrases about assorted marbles. But if someone is specifically looking for RED MARBLES, have a web page optimized for “red marbles” so this web page is served up by search engine results. The white marbles represent other words on the page that support the keyword phrases. Perhaps, how red marbles are used or are the favorite of top marble shooters. A more realistic example could a pet store. The owner may choose to have a particular web page in their website optimized for “dog flea control products.” The keyword phrase for this specific page should be about your “dog flea control products”, not about “pet store”. This web page can help their pet store attract itchy dog owners in the summer months. You can also improve your website’s SEO by taking action outside of your own website. Claim your listings and add website’s URL address on business citations or online business listings such as manta.com Merchant Circle, Yellow Pages.com etc. Learn more about incoming links in our articles: why you should care about backlinks and what to know about backlinks. Another way to increase incoming links is to build relationships with influencers and/or bloggers in your industry and niche. If you have a relationship with reputable, high-authority site owners, perhaps they would do an article about you and your company’s products and link to your site and create an inline context link. You could offer a free sample for them to try and review. Another Dark Side WARNING: Do not confuse this with paid farm links sites which can damage your website’s reputation. So use these three SEO Super Powers to land your website on Google’s first page! Want help with your website and Internet presence? Contact UmeWorks in Torrance at 323 638-9328 or info@umeworks.com to discuss your website needs. This is a common question I receive after clients review their Google Analytics report. The way digital marketing works is pretty simple. A visitor comes to your website from any of the traffic channels including search engines, social media, blogs and so forth. The visitor then learns about your products by reading through some of your content. If they are impressed by an offer, they can choose to take action in the form of making a purchase, downloading an e-book, signing up for your email newsletter, etc. However, things don’t always follow that path. Sometimes, a visitor might come to your website, look around, and leave without taking a desired action. In fact, they could even leave without clicking on the menu or any of the links on your page, right? When that happens; when a visitor simply comes to your site and leaves without engaging with the page at all, we say that the visitor has bounced. What is Bounce Rate and Why is it Important in Marketing? The Bounce Rate of a Web Page = Total Number of Bounces on a Page in a Given Period ÷ Total Number of Page Entrances over the Same Period. The page doesn’t provide the answers visitors are looking for. Although Google doesn’t use bounce rates to determine a site’s rank in search engine results, even terming bounce rate metrics as “spammable and noisy,” that doesn’t mean you should turn a blind eye to high bounce rates. For one, when visitors come to your site and leave without engaging with the page, it becomes difficult to convert those visitors. Additionally, in AdWords, a high bounce can negatively affect your Quality Score, leading to a higher Cost Per Click (CPC). In Google Analytics, any single-page visit is counted as a bounce no matter the amount of time a visitor spends on that page. The first step is to change this so that Analytics takes into account time spent on the site when calculating your bounce rate. The Analytics dashboard has something known as profit index which is a database of web pages most frequently viewed prior to conversions or transactions. Rather than attempting to fix the bounce rates of all pages on your site, focus on fixing these profit pages. If certain traffic channels are bringing in visitors who are not interested in your products/services, then you’re going to see high bounce rates. Taking out these low-value traffic channels can significantly boost your bounce rate. Finally, visitors could be leaving without taking any action because your Calls To Action (CTAs) and Landing Pages are poor. Perhaps your CTAs are not compelling enough, or your landing pages don’t satisfy visitor queries. Fixing these issues can lower your bounce rate. Of course, you can’t have a 0.00% bounce rate. But, if you can implement the four strategies discussed above, rest assured of a meaningful improvement in your bounce numbers. Get more details in our Guide to Reducing Your Website’s Bounce Rate. Did you know starting this month Google Chrome will start displaying prominent “Not Secure” notification on websites without an SSL (secure sockets layer)? If you’re not sure, visit your website and check the address bar. If you have an SSL installed, you will see “https” vs. “http”. If you don’t have one, users will be deterred from visiting your website. Avoid having your website flagged by Chrome as not secure. Install an SSL certificate for your domain and subdomains and offer your website visitors confidence and protection when they go to your site. More about why it is important to install in SSL on your website. Great News! You finally finished your new WordPress website. Take a moment to marvel at its beauty and pat yourself on the back for a job well done. Now that the moment has passed, it’s time to start thinking about updating that beautiful old site. That’s right old. Welcome to the digital age where websites can be put up quickly and become outdated even quicker — both the content and software. If you’re thinking that your website doesn’t need to be updated on a regular basis then here are a few things for you to consider. You may be thinking that your WordPress site does not need to change its appearance but you may be forgetting an important factor. Your website may no longer be secure. Thousands of WordPress sites get blacklisted due to hackers, malware, and ransomware. One of the best ways to protect yourself is to make sure your WordPress site stays updated. Since WordPress is open source software, it will typically receive minor updates automatically. For major updates, you will need to do the work yourself. Deciding not to do this can leave your website seriously exposed. The other factor to consider from a security perspective is that WordPress uses a large number of third-party plug-ins. Each one of these third-party maintainers releases updates to their plug-ins. That means that you need to be mindful of more than just WordPress open source updates. The damage to your website and your credibility from a successful cyber-attack can ruin your website. So now you may be thinking that you can just do the updates that concern you the most. Skipping updates here and there can’t really hurt, can it? Well, yes it can. Skipping updates can actually cause significant problems. Open source software solutions are great in that so many talented people can contribute to its overall success. The downside to this is that there are several opportunities for problems to be introduced. If you choose to skip updates you may spend more time resolving problems than you would have spent just doing the updates in order. Many a WordPress website has experienced unnecessary downtime because its owner was “saving time” by skipping updates here and there. To help you keep your WordPress website up to date, here are a few simple steps that you can follow to safely upgrade your site. 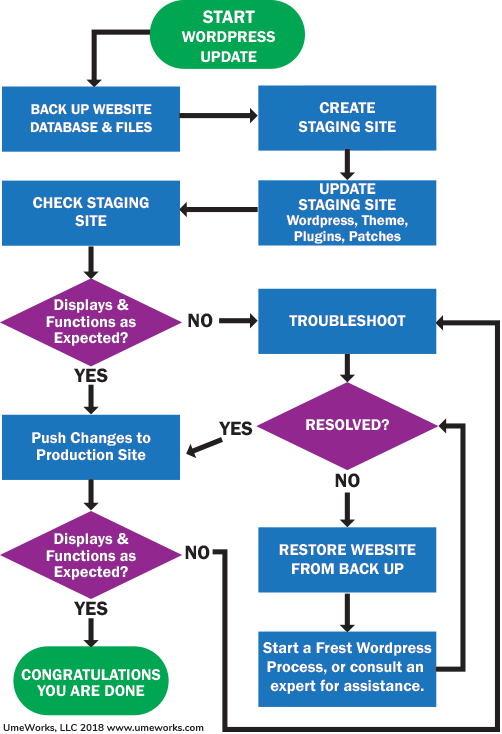 Create a backup site – Before you do any changes to your production site, you need to create a backup. This will allow you to restore the site quickly if anything goes wrong with the upgrade. Create a Staging site – The next step is to create a staging site. This is a copy of your WordPress website that you can safely make updates to. Updates made to your staging site will not be reflected on your live production site. Accept updates – This is where you incorporate the updates to WordPress, your theme, and the various plug-ins. Test the staging site – Now that the changes have been applied, you can safely test your site to see if there were any problems. If so, you can fix them without disrupting the live site. Move changes to the production site – Once you are happy with the testing, you can move the updated site to your production libraries. Test the live site – If it works then great. If not, then you can restore from the backup. Following these simple steps will keep your WordPress website updated and running smoothly. Make Sense, But You Already Have Enough to Do? We know you didn’t go into business to maintain your website. The good news? UmeWorks can help. You do what you do best, and we’ll do the same. We can keep your website humming along – we’ll update the software – and the content too, if you wish. Just contact us to get started. We can even set you up with a site security monitoring service if you’d like that peace of mind.